From Corned Beef & Cabbage and Shepherd’s Pie, to cheeseburgers, salads and pizzas, D’Arcy’s menu brings Ireland and America together. In addition to the fabulous food, D’Arcy’s features a full bar and a festive atmosphere. Let us pour you a glass of your favorite beverage then join in on the fun. Have you heard about our horseshoes? If you’re among the uninitiated, a horseshoe is quite simply one of the most brilliantly-decedent dishes ever created. Your choice of meat on a bed of Texas Toast, piled high with fries and then smothered with D’Arcy’s famous cheese sauce. Trust us, it tastes even better than it sounds. While others may lay claim, no place makes a better horseshoe than D’Arcy’s. Give the gift of great food and happiness! Doing good turns for family and friends is embedded in Irish culture. And what could be a better gesture of your good intentions than giving a gift card to D’Arcy’s. 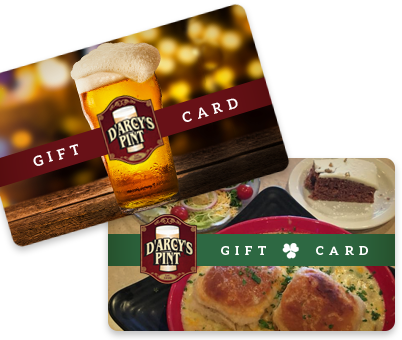 For your convenience, you can purchase D'Arcy's Pint Gift Certificates online. Please complete the secure form below. After we process your request, your gift certificate will be mailed to you. And we promise to protect your confidential information. Thank you for your purchase. We’re sure your kindness will be rewarded.